WoW BFA is now live! Watch our YouTube channel linked at right over the next few days. We are/will be posting this week playthroughs and cinematics recorded from the first minutes of live and from subsequent days. Both Alliance and Horde story questlines and great tourism views of amazing scenery! Unlike some previous expansions, you can’t just go off and quest and pick herbs or mine in BFA. Like old Vanilla WoW, you need to train BFA professions before you can use them. All professions. Including herbalism, mining, skinning. If you don’t pay your 50g per profession and train, you will not see the nodes / plants in game. I trained each alt on all their professions in Boralus / Dazar’alor as all trainers are close together. I can change out professions later if I want. A side effect it seems of splitting profession leveling by expansion rather than having one set of 950 levels across all xpacs. 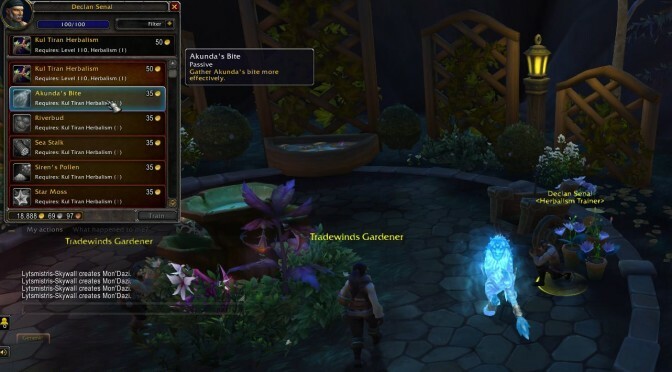 This is different from Legion / WoD / MoP where if you had the profession previously, you could go out and gather and get petals / shards / dust and a quest to go get trained. 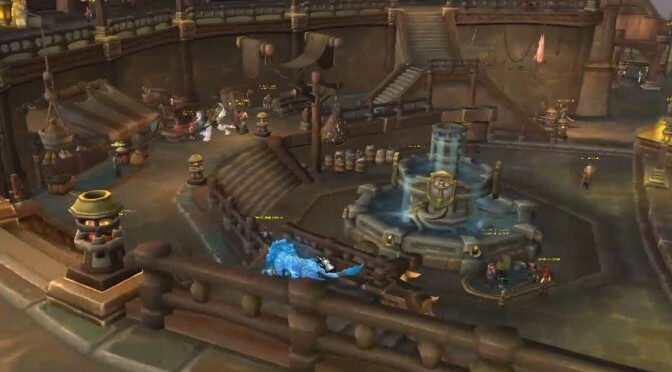 Another side effect is a nasty bug on last week’s 8.0.1 pre-patch DarkMoon Faire (DMF) where max level characters near the top of a Legion profession’s levels couldn’t use the profession quest in DMF to get remaining levels. No levels were awarded on completion of the quests. Happened to me on alts that were 106/115 (racial profession), 97/100, 99/100. on several professions Hopefully that gets fixed as some Legion professions had problems reaching 100 without DMF quests for final points. Baby characters (allied races) leveling had no problems getting the +5 levels boost on DMF quests. Here’s my solo way to get low level alts into Pandaria, which is normally only accessible by level 85 characters through the Mists expansion’s introductory questline.